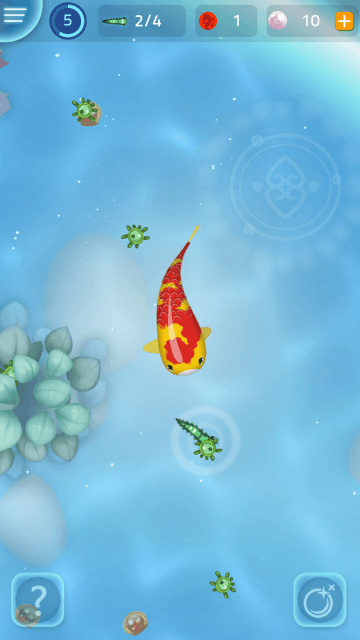 Zen Koi 2 is Landshark Games gift to loyal fans. This relaxing fish collector is based on a popular Asian myth. 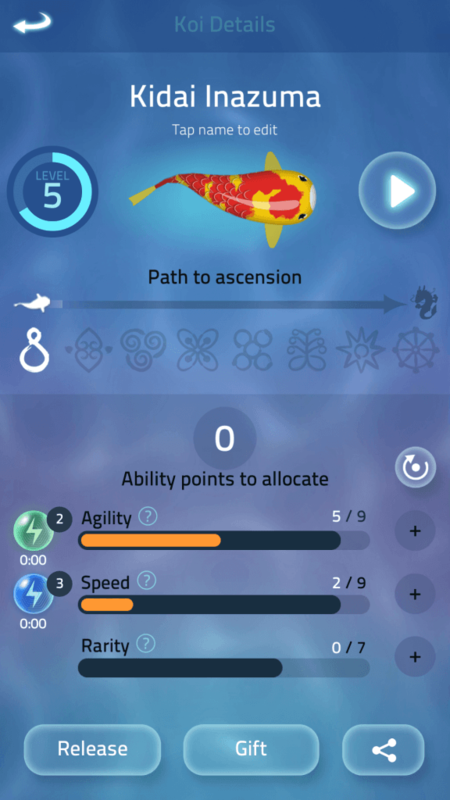 You can control your fish, breed to collect more rare and uncommon fish and finally ascend your Koi to a magnificent dragon. The game also lets you manage your own pond and decorate it. Zen Koi 2’s enchanting music and the slow, yet addicting gameplay will make you forget everything. You will just want to explore the beautiful pond that harbors strange and exotic creatures. Most of your time will be spent in catching small aquatic animals. Tapping a prey will make your fish follow it until he catches it. But this can be time-consuming, especially when it comes to catching fast-moving prey. The best way to catch creatures is to tap and hold the screen using your thumb and then move your thumb towards a group of smaller creatures. Your fish will follow your finger and automatically start catching those who come within her range. Use your finger to explore the pond and hunt for groups of sea creatures. You can drag your finger upwards instead of sideways to catch more prey. Since the game has a portrait orientation, the screen is longer vertically, giving you more space when you catch fish. Along with following this trick, you can also improve the Agility and Speed abilities to make your fish reach his prey faster. To do this, read the next section. If you want your fish to move faster and make sharper turns, then you should allocate ability points to key abilities such as “Speed” and “Agility”. You get skill points when your Koi levels up. You can see the level-up bar at the top-left corner of the screen. The circle fills up little by little when your fish catches prey. Once full, you will get a few points, which you can distribute to the first two abilities. 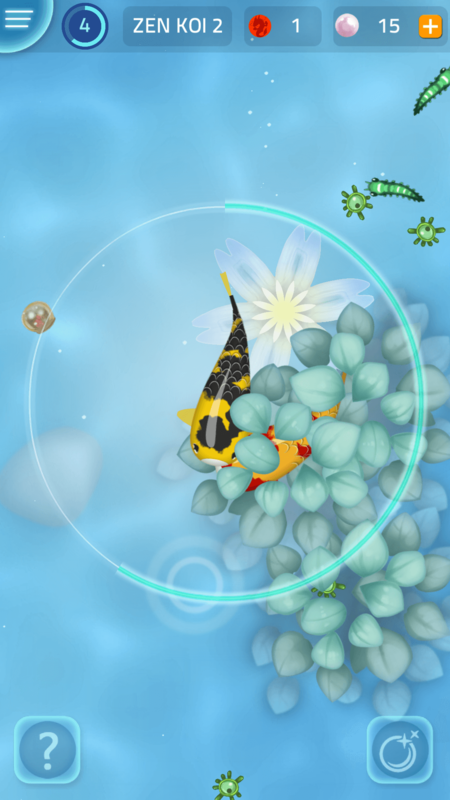 To allocate points, tap the menu button on the upper-left corner of the screen, tap “My Koi” and then tap your fish. Your fish can start breeding from level 4 onwards. Once s/he becomes an adult, you will come across a potential mate. Breeding starts when your fish and his mate are inside the circle. You will notice that the white circle fills slowly if both fishes are inside it. Even if a part of a fish’s body is outside the circle, breeding stops and the filled part of the circle retracts, making it a bit tiresome for you to get both inside and start breeding again. Make sure both fishes are inside the circle and to make this possible, you should follow your mate by tapping and holding the screen and moving the finger to the direction where she is moving. When you spot a fish, let her come towards you. Once she is near you, she will start moving away from you. Just Swim close to your mate. You should also consider improving your fish’s speed and agility abilities so that you can follow her faster. Once the circle fills up completely, you will receive an egg. You can save the egg on an empty slot. It will take some time to hatch and egg if you store it in the slot. Once it’s ready to hatch, you will receive a notification. You can then hatch Koi. You can also release the egg if you feel you might get a duplicate fish. The baby fish will carry the characteristics of your fish and its mate. You can increase the chance of rare colors being passed to your offspring by improving the “Rarity” ability. Spend ability points to it if you want a rare color pattern. 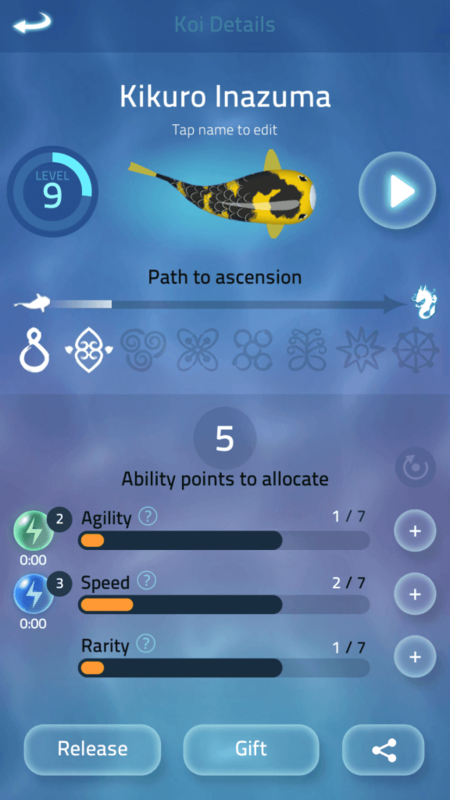 The higher your “Rarity” ability, the more the chances of getting a rare fish after mating. You might stumble upon a pearl while exploring the pond. A pearl can be hidden inside an aquatic flower. Flowers also hide agility and speed boosts. Just move your fish towards pearls and flowers to collect them. You will also get them as Daily rewards. Play the game every day to get them. You can also watch videos to earn pearls. Tap the pearl icon at the upper-right corner of the screen and then tap the first button. Firstly, you should check the path to ascension map. You can find it by tapping “My Koi” and then selecting the fish you are currently using. Your fish’s path to ascension consists of several symbols. You will need to activate each of them to ascend your Koi. In the screenshot below, you can see this. You will see a list of symbols lined up horizontally just below the dragon path. There are 8 symbols, out of which two have been activated and six are remaining. Now let’s see how to activate each symbol. 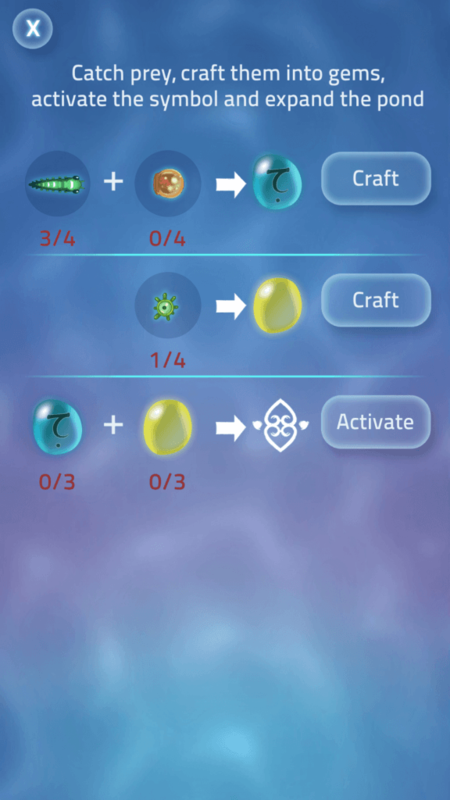 Once you have crafted the required gems, tap the activate button next to the symbol. This will not only let you inch closer to the path to ascension but also expand your pond, allowing you to explore more and catch better prey. Once all symbols have been activated, you can ascend to a dragon. You will receive dragon points and pearls upon ascension. You will also unlock a mini game where you will collect essence. When you get one, just follow the rays to find another. The essence you have collected can be used to unlock and decorate your own personal pond. You can also play with the same dragon. You will need “Awaken Orbs” to play with your dragons again. You can get these orbs by ascending a dragon or through daily rewards. What is considered a completed pattern? There is this certain prey that’s so hard to catch, the big, hard scale looking fish that’s got its fins on the side..it seems like the way to catch it is to approach it at the front which is quite hard because it shies away from my Koi when approached. Any suggestions? I guess that’s rock/stone fish and she has hard scales on her back. Your first objective is to eat her hard scales, and to do this, you can approach the rock fish from the back. You will notice that nothing will happen, but upon careful observation, you will see that fish will lose her scale every time you try to eat her. You will have to keep eating her scales by approaching her on the rear until all her hard scales are eaten off. You can then eat her and you don’t have to approach her on the front.